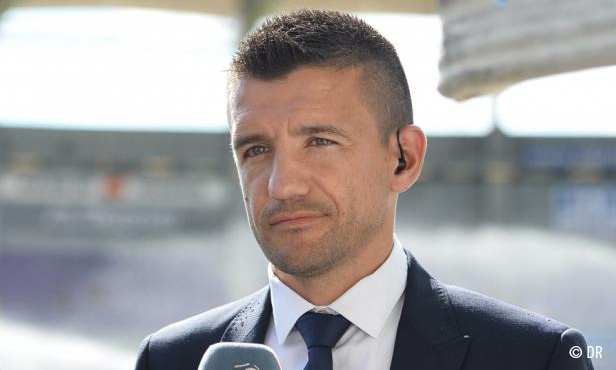 Having been an OL midfielder for three seasons between 2001 and 2004, the Canal + pundit has particular insight into this Europa League semi-final return leg on Thursday 2105 at the Parc OL. He shares his views ahead of this decisive match, but also his experience, since he was part of the team that pulled off the amazing win against FC Bruges in 2002. After the match in Amsterdam, club president Jean-Michel Aulas drew attention back to the encounter with Bruges in the 2001-2002 season. What do you remember about this UEFA Cup tie? I remember that we completely missed the first leg in Belgium. The goal scored by Peguy Luyindula kept our hopes alive despite our going down four goals to one. At the end of that match, the Belgians were just about celebrating their qualification with their fans. That really irritated us. In the return leg, we showed another side of ourselves and we were able to count on Sonny Anderson’s talent. What about his hat-trick in the return leg at Gerland? To turn this type of situation around, you always need great players. We saw this recently in the Champions League in the clash between Real Madrid and Atletico where Ronaldo made the difference all by himself. Back in my time, we could rely on Sonnygoal. We didn’t have to worry about scoring the third goal in injury time (OL qualified 3-0 thanks to a hat-trick from the Brazilian including a goal in the 92nd minute). Unfortunately, that feat didn’t do us that much good because went out in the next round: in the round of 16 at the hands of the humble team Slovan Liberec. This time, to pull it off would be great because it will open the door to a first European final in the club’s history. Did you prepare differently for the return match? No, just as usual, playing cards… We had some experienced players like Christophe Delmotte, Pierre Laigle. We also had some players who knew how to stay calm. You know, there’s no point in trying to play the match before. It’s on the pitch that you need to try to qualify. How should OL approach this return leg? They need to avoid looking back. They need to play high up the pitch so that they can put pressure on this Ajax team. That’s what FC Barcelona managed to do this season in the Champions League in the return match against PSG. They didn’t win that match because of their technical skill, it was more a case of mental strength. Apart from that, this match will be a hard fight. It’d also be good to score early. That could boost the players’ confidence and enable OL to completely turn around the first leg result. What are you thoughts about the first leg? In Amsterdam we saw how OL have gone wrong this season, how they have trouble getting everyone to defend together. But it’s not the time to make a ledger for the whole season. That should be done later. For now, we need to focus on this semi-final return leg. We also need to tell ourselves that we did some things well in the first leg, like create plenty of chances. OL also need their main goal scorer. I hope that Alex Lacazette will be fully fit because he, like Sonny could for our team, can swing this semi-final in our favour.